Address: 685000 Magadan, Portovaya st., 8. 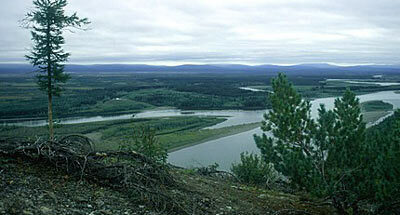 Zapovednik Magadansky, in the Olsky and Srednekansky Districts of the Magadan Region, was established in 1932. Its area is 883,8 thousand ha. 4. Seimchansky on the left bank of the Kolyma River, including mountain ranges (elevations up to 1500 m above the sea level), sites with low hilly topography and lowland paludal valley along the coast zone. The vegetation is that north-taiga mountain open woodlands of Dahurian larch and elfin Siberian pine woodlands; on plain sites are herb-bog and sphagnum moss bog open larch woodlands. The floodplains of big rivers support poplar-Chosenia and larch forests with a dense understory of rich species composition. On above-floodplain terraces the larch forests are sparser and on the slopes they turn into open woodlands with an understory of the dwarf Siberian pine elfin woodland. In the subgolets zone open woodlands are replaced by thickets of the dwarf Siberian pine; still higher the mountain tundras-shrub and lichenare developed. There are sites of alpine glades. On the south-facing slopes of the Olsky site occur pure Erman's birch woodlands with a shrub understory. Along the wide valleys of the rivers flowing to the coast are thickets of willow and alder forests, which are replaced near the sea by herb meadows and mires. The flora features some species on the northern edge of their distribution range, relict or rare in the District concerned, including the Siberian spruce, Moneses uniflora, Clematis fusca. The fauna is that of Eastern Siberian taiga species. The moose, wild reindeer, brown bear, sable, otter, blue hare, northern pika are common. The bighorn sheep is rare. The lynx, wolverine occur; the wood lemming, Amur lemming and black-capped marmot are few in number. 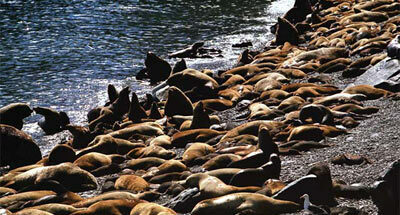 On Yamskye Islands (island Matykil) are sea lion rookeries. Offshore are aggregations: the bearded seal, ringed seal, ribbon seal. The following birds are characteristic: nutcracker (Nucifraga caryocatactes), Siberian jay (Perisoreus infaustus), willow grouse (Lagopus lagopus), rock ptarmigan (Lagopus mutus), hazel grouse (Tetrastes bonasia), Siberian capercaillie. Bird colonies are characteristic as the common and thick-billed guillemot, kittiwake, slaty-backed gull, fulmar, pelagic cormorant. 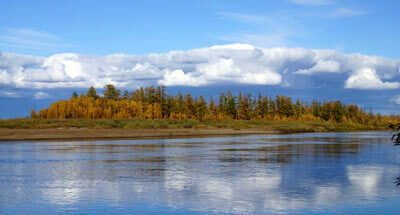 The Zapovednik lies on the main migration route of geese, swans and ducks. The birds nesting in the Zapovednik are: the osprey, white-tailed eagle and Steller's sea eagle, golden eagle, peregrine falcon, Arctic falcon. Stopping over on the flyway are: the Ross gull, Eurynorhynchus pygmaeus. The water bodies are home to over 30 fish species, including Salmonidae: chum, humpback, Coho, common brook trout, East Siberian char, inconnu, occasionally, king salmon. Grayling is numerous. There is also Siberian sturgeon.